The week after I wrote it was odd we hadn't seen any return touchdowns, Leavenworth's Juwan Potts had one of the better return games you'll ever see from a player. Free State scored first when they closed a drive with a four-yard touchdown run from Joe Lane in the first quarter. Potts answered on the ensuing kickoff with a 95-yard return for a touchdown to tie the game at 7. Later in the quarter, Free State closed another drive with a touchdown run on a five-yard play from Zion Bowlin to go up 14-7. 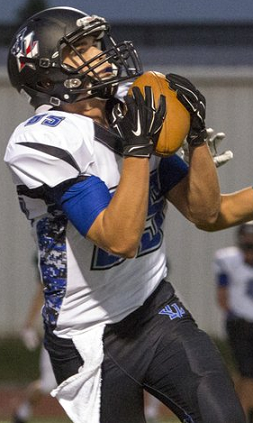 But Leavenworth answered quickly when Landry Hodges found Jacob Bohneman on a five-yard touchdown pass to make things 14-13 after a missed PAT. Leavenworth recorded the only score of the second quarter when Hodges found Potts on a 30-yard touchdown pass to put the Pioneers up 21-14 after a successful two-point conversion try. Potts then opened the second half with a 94-yard kickoff return for a touchdown to make the lead 28-14. Free State didn't answer until late in the third quarter when they finished a drive with a four-yard touchdown run from Lane, to pull to within seven at 28-21. Leavenworth controlled the terms of the fourth quarter, however. A three-yard touchdown run from Sanchez Williams with 1:45 left in the game put the Pioneers up 35-21, and solidified the victory. No box score was reported. After trading first half touchdowns, Olathe South added a late second quarter touchdown to take a 14-7 lead to the half. The Falcons scored first in the third quarter on a touchdown pass from Jake Seurer to go up 21-7, before Olathe Northwest answered with a Jack Hatzfeld touchdown just before the end of the quarter to make things 21-14. Olathe South went on to add two fourth quarter touchdowns to comfortably claim their third victory of the season. The Chesty Lions pretty much controlled this one throughout. Two touchdowns runs of 44 and 26 yards from JD Woods gave LHS a 14-0 lead early. SM Northwest's Jonathan Killeen clipped in a 47-yard field goal to make things 14-3 at the end of the first quarter. Trey Moore added LHS' third touchdown of the day on a one-yard touchdown run to put his team up 21-3, before they recorded a late first half safety to make things 23-3. Nyle Anderson opened the second half with a 97-yard touchdown run to give LHS a 30-3 lead on the front-end of the third quarter. An Ellis Springe field goal, followed by a 25-yard touchdown run from Moore made things 40-3. Touchdown runs from SM Northwest's Xavier Perry and Jake Honer drew things to a 40-18 conclusion. No box score was reported. SM North went up 7-0 early on a 60-yard touchdown pass from Will Schneider. Olathe East answered when Chase Miller found Zach Cahill on a 15-yard touchdown pass to tie the game. The game was tied at the half. In the third quarter Jalen Branson scored on a three-yard touchdown run to give Olathe East a 13-7 advantage. Schneider connected on another touchdown pass later that quarter, giving SM North a 14-13 lead. Next, Miller found Cahill on a 45-yard touchdown pass, and a successful two-point conversion made things 21-14 in favor of the Hawks. Olathe East finished the game with a 24-yard field goal from Chris Diddle and a two-yard touchdown run from Branson. This outcome was more along the lines of what we expected from Olathe North entering the season. The Eagles opened scoring on a 33-yard touchdown pass from Cole Murphy to Jeighlon Cornell. Next, Marcel Spears intercepted a SM South pass and took it back 40 yards for a touchdown. The Eagles went up 21-0 in the first quarter when Venus Triplett added a 50-yard punt return for a score. Triplett added another score on a one-yard run in the second quarter, before Murphy found Josh Moore 14-yard touchdown pass. The Eagles took a 35-0 lead to halftime. In the third quarter Murphy found Cornell on an 80-yard touchdown pass to make the game 42-0. The Eagles' final score came on a 24-yard touchdown pass from Matt Wright to Kaleb Brooks. For the second year in a row, SM East controlled the tempo of the Nut Cup from start to finish. Wyatt Edmisten was really the star for the Lancers, scoring the first four touchdowns of the game on runs of one, three, 15, and one yards to put SM East up 28-0 late in the second quarter. SM West was able to remain in the game after they scored in the final seconds of the second quarter on a 12-yard touchdown pass from Adam Rellihan to Israel Watson. 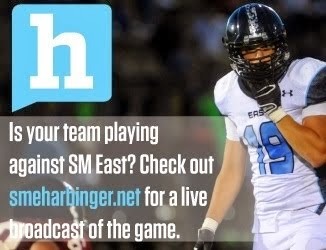 At the half, SM East led 28-6. SM West recorded the only score of the third quarter on a four-yard touchdown run from Tarik Watson to make things 28-13. But SM East controlled the fourth quarter, adding touchdowns from Edmisten and Jackson Gossick on runs of two and three yards to go up 42-13. A late two-yard touchdown run from Isaiah Macklin made things 42-19. James Reyes is not on the team. #83 is Isreal Watson. SME had the wrong roster. Thanks, Mikita. It's been updated.